Suspension training is one of the most functional and effective ways to increase strength, especially if you’re an athlete who needs to be able to move your body to perform. This is because suspension training requires you to move and stabilize your own body weight through a variety of movement planes, versus more traditional methods that involve sitting or lying down where your core is supported and locked into a predetermined path of motion (usually pressing weight plates). Training to move your body weight and move your body as a unit develops strength, but this training is also about developing motor patterns and neuromuscular timing. The result is better stability and improved ability for your muscles to do more complex movements while still working together as a whole. A strong core can be your saving grace on the bike when you get hit by that unexpected gust of wind, an unexpected elbow from a drifting cyclist, or an inadvertent slam into that unseen pothole. A good core also helps you maintain form through adverse conditions and fatigue. 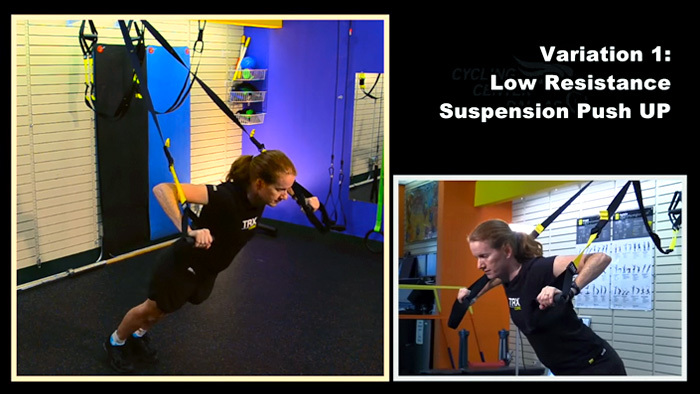 The following are five of the best suspension trainer movements for cyclists and triathletes. The video examples of each movement show the most basic progression followed by the more advanced progressions. This movement increases both strength and stability in the upper body and core. It helps give better support and control of your body in unstable positions on the bike (sudden swerves, unexpected potholes, etc.). It also increases power transfer from the upper body to the legs during hard and/or out-of-the-saddle efforts. If you’re a triathlete, the TRX Push-Up can add strength to your swim stroke as well as upper torso run mechanics and overall posture. To make this harder, slide back to load more of your body weight onto the straps. To make it easier, step forward to support more of your body weight with your feet. You can also progress to suspending your feet instead of your hands. This is another great all-around movement that targets opposing muscle groups to the pushup. It can improve posture both on and off the bike, and strengthen the large muscles in your back. As an added bonus, this exercise can add power to your swim stroke. To make it harder, step forward and place your feet further underneath the anchor. You will end up leaning back further as well, putting more body weight on the straps which means you will lift more weight. This one adds strength and stability to the pedaling down stroke, especially during out-of-the-saddle climbs or accelerations. It also It helps triathletes and runners develop the strong leg extension required for forward propulsion and pushing up inclines. Start slow and increase the speed of the movement when you feel comfortable with it. To progress this exercise, add a “hop” at the top of the movement and focus on maximum acceleration when pushing yourself up from the bottom. This is a great all-purpose movement, as a strong core is beneficial for endurance performance as well as general strength for all activities. It builds the strength necessary to stabilize and create a solid center of mass for driving movement. A stronger, more stable midsection can contribute to stronger bike positioning and run mechanics, as well as delaying fatigue in either activity. You may have already performed, or are currently practicing the traditional plank movement as part of your program. Shown here are three progressions of the traditional Plank using a suspension trainer. If you have not already done the traditional plank, work on that movement first by starting with your feet on the ground instead of in the straps. Progress to the straps only after you feel you have mastered the traditional version of the Plank. This exercise is all about form. Your hips need to stay up; don’t let the lower back sag; keep the shoulders soft and the back flat (no rounding the back). It’s easy to start losing form with fatigue, so make form a priority and focus. Doing this exercise in front of a mirror will allow you to self-monitor your form. There is no need to hold this position for minutes at a time. Work up to intervals of 45 to 60 seconds and then progress adding additional sets, or performing a more advanced progression. This performance is especially great for runners and cyclists, as it trains muscles to maintain stability while supporting the body on one leg. Running in particular requires the “stance” leg to stabilize while the rest of the body moves. A lack of stability in your pedal stroke can also leak energy away from the pedal, and create stress on hips, knees, and ankles. If you feel wobbly or are losing your balance, reduce the range of motion until you regain control. Start again slowly and only go down to the point where you feel it challenges your balance, then come back up. As with any program, begin at the lower level and work up to the advanced movements. Be cautious, and always use your judgement when performing these exercises. Using these five suspension exercises can increase your strength and stability while reducing your risk of injury.